The annual publication by Forbes magazine of the Forbes 400, a list of the richest people in the United States, and its lists of the richest people around the world provides evidence of the enormous wealth available to those profiled, most of them successful entrepreneurs. In the 2007 list of the World's Richest People, 946 named billionaires had a combined wealth of approximately $3.5 trillion. The collective net worth of the richest Americans in 2007 is $1.54 trillion. Each of these men and women has enough resources to make a major difference in the fight against the global epidemic of H.I.V./AIDS. The United Nations agency coordinating the response to the global epidemic, UNAIDS, estimates a funding gap of $8.1 billion at the end of 2007. In the coming years, if the global response to AIDS continues at its current pace, the UNAIDS forecasts an annual cost of $15.4 billion in 2010 and $22.5 billion by 2015 in low- and middle-income countries. A continuation of the current pace of response, however, will mean that at least two-thirds of those who need lifesaving antiretroviral drugs will not be on treatment by 2010. By 2015, a similar proportion of people in need of lifesaving medicines will not be on treatment. A unique situation now exists for significant intervention in the fight against H.I.V./AIDS by the richest people in the world. It is possible to turn the superstar entrepreneurs and richest people of our time into superstar philanthropists in the fight against AIDS. The key to the intervention of the super rich is to narrow down areas of potential impact on AIDS relief so that they know they are making a significant and measurable difference. The UNAIDS estimates that the financing of AIDS relief in the last three years has come up slightly less than 50 percent of what is needed. Uncertainty over future funding slows down long-term planning in poor countries with a heavy AIDS burden. These poor countries already account for one-third of the expenditure in the fight against AIDS. The UNAIDS estimates that in the next decade, these poor countries are unlikely to increase their proportion of AIDS expenditure even with expected higher numbers of individuals needing clinical care and social support. Another urgent issue is the need to provide antiretroviral therapy to the millions of people living with H.I.V./AIDS who need these medicines to stay alive. Fortunately, this urgent task is engaging the attention of bilateral and multilateral agencies. The steady decline in the annual cost of antiretroviral medicines is making it easier to provide lifesaving care to people living with H.I.V./AIDS. The fight against AIDS also faces the urgent task of preventing new H.I.V. transmission. Resources need to be available and deployed toward effective information, education, and communication campaigns against H.I.V. transmission. Results from H.I.V. preventive programs so far have been mixed. Funding for preventive programs, however, continues to remain a high priority of bilateral and multilateral agencies and foundations. A formidable urgent task in the fight against H.I.V./AIDS is to design, test, package, and deploy effective H.I.V. vaccines. There had been well-publicized setbacks in the race to find an effective H.I.V. vaccine in 2007. Foundations and Western governments, however, continue to marshal resources to ensure that the global network of researchers is working collaboratively on promising candidate H.I.V. vaccines. There are two urgent issues in the fight against AIDS for which dedicated resources are yet to be mobilized. First, the urgent task of providing care and support to 15 million AIDS orphans has yet to benefit from significant resource mobilization. These children, 16 years old or younger, have lost one or both parents to AIDS. The numbers of these AIDS orphans has grown so quickly in many impoverished communities that cherished extended family support systems either are under severe strain or have collapsed. Second, the scarcity of a skilled health workforce is crippling the response to AIDS in many countries at the frontlines of the global epidemic. Current resource mobilization efforts to address the severe health workforce crisis in poor countries have yet to reach critical mass. Sub-Saharan Africa, the epicenter of the global epidemic, represents 68 percent of all individuals living with H.I.V./AIDS but accounts for only 3 percent of the global health workforce. At least 1 million health workers are needed in Africa as soon as possible. The richest people in the world can make a major difference in the care and support of AIDS orphans and the training and re-training of health workers. Scale up of resource mobilization on AIDS orphans in poor countries and significant support for successful, community-based programs for AIDS orphans and vulnerable children. Scale up of resource mobilization on rapid training of health workers in poor countries and significant, long-term support of nationally validated health workers training and retention programs. Supporting proven global public/private/civil society alliances on AIDS orphans and health workforce development in poor countries. The United Nations estimates that by 2010 there will be at least 20 million AIDS orphans worldwide. 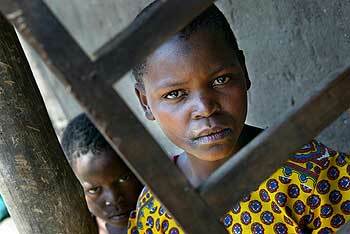 More than 80 percent of AIDS orphans live in sub-Saharan Africa. Most of the AIDS orphans are under the care of desperately poor relatives, including infirm grandparents. These children need to be fed, be cared for in a nurturing environment, have access to regular and timely medical care, attend school on a regular basis, and be sheltered from the dangers of the street. AIDS orphans also need to complete secondary school and proceed to universities or technical schools. AIDS orphans need to be prepared to successfully transition into the labor force and become model citizens. As a colleague and I have shown in a recent book, "Africa, AIDS Orphans, and Their Grandparents," these children desperately need sustained support and care as they transition into adulthood. An AIDS orphan initiative supported by the richest people in the world should be comprehensive enough to provide care and support to these children from the time they lose their parents until they become independent young adults. The intervention should be of such a comprehensive scale that the children will be sheltered from street life and believe that a bright future awaits them and their siblings. A comprehensive initiative on AIDS orphans should include a plan to deal with the annual cohort of new orphans as their parents die of AIDS. The ultimate goal of the AIDS orphan initiative should be to create a scenario where former AIDS orphans become leaders of their communities and help break cycles of unabated H.I.V. transmission. The Group of 8 nations at their 2005 Gleneagles summit agreed to work with international organizations to "develop and implement a package for H.I.V. prevention, treatment, and care, with the aim of moving as close as possible to universal access to treatment for all those who need it by 2010." To achieve universal access to H.I.V./AIDS services and support, the UNAIDS estimates that support for AIDS orphans and vulnerable children will cost $2.4 billion in 2009, $4.4 billion in 2010, and $4.5 billion by 2011. Between now and 2010, comprehensive support for AIDS orphans and vulnerable children requires a financial outlay of $11.3 billion. Nearly $7.5 billion of this funding will go to the support and care of AIDS orphans in sub-Saharan Africa. Line item support for AIDS orphans and vulnerable children include expenditures on educational needs, healthcare support, family/home support, community support, and programming support. In addition to the earlier proposed global AIDS initiative, the richest people in the world may provide specific line item support for current global programs such as UNICEF and the Global Fund to Fight AIDS, Tuberculosis, and Malaria. They may also collaborate with major foundations to finance specific AIDS orphans initiatives in poor countries. The richest people in the world can provide sustained support to end the health human resources crisis that is hampering the fight against AIDS. This support can be short term and long term. In the short term, the support can finance the recruitment of qualified health workers from around the world to work in poor countries. The pool of potential recruits should focus on skilled diaspora populations of poor countries living in the West and on experts that have practical experience in regions or countries that require assistance. The important issue is to link available skill sets to specific, identified needs in countries requiring assistance. In the long term, the richest people in the world can support the training of additional doctors, nurses, pharmacists, laboratory technologists, and other health personnel through dedicated support for the revamping of existing medical and public health schools in regions and countries requiring assistance. It takes about six years to train a doctor in Africa and at least three years for a registered nurse. To ensure retention after training, a health workforce initiative supported by the richest people in the world should include wage augmentation and incentive packages. The newly trained health worker should have enough remuneration and quality-of-work incentives to commit for the long term. The UNAIDS estimates that an additional 3,070 medical students and 5,700 student nurses every year should be in the pipeline between 2006 and 2008 in low-income countries, Botswana, and South Africa as part of the long-term solution to chronic health workforce shortages. The UNAIDS anticipates that the first nurse graduates from this cohort should be available in 2009 and the first medical graduates will come onboard by 2012. The UNAIDS estimates that to achieve universal access to H.I.V./AIDS services and support, human resources needs in the health sector will require financial outlays of $1,043 billion in 2008; $1,269 billion in 2009; and $1,327 billion in 2010. Between now and 2010, human resource needs in the health sector require at least $3.64 billion. The richest people in the world may support existing global alliances dedicated to AIDS orphans and health workforce development. The UNICEF has been a leader in marshalling attention to the problems of AIDS orphans and vulnerable children. Working with other international organizations, the civil society and professional entities, UNICEF has leveraged its global experience in resource-challenged environments to raise awareness about the plight of AIDS orphans. The World Health Organization-based Global Health Workforce Alliance is a public/private/civil society alliance dedicated to resolving the health workforce crisis. The alliance is working with governments of resource-challenged countries and other stakeholders to develop proactive policies. The Alliance is also actively engaged in organized efforts to develop and deploy research networks that provide information on best practices. The global alliances working on both AIDS orphans and health workforce development do not have significant financial resources. They are also not actively engaged in community-based responses or in the massive resource mobilization needed to jumpstart initiatives on human resources for health. This situation creates a unique opportunity for the richest people in the world to make a difference. These are the best of times for the richest people in the world. In 2007, 946 billionaires had a combined personal fortune of $3.5 trillion. For about $11.1 billion between now and 2010, the richest people in the world can make a significant difference in the lives of millions of AIDS orphans in poor countries and help create a formidable health workforce at the vanguard of the fight against H.I.V./AIDS. Millions of AIDS orphans and millions of individuals living with H.I.V./AIDS stand to benefit from the assistance of the richest people of our time. The richest people in the world have an extraordinary, unique opportunity to make a lasting contribution to the global fight to stop AIDS.